Luo Fei: You were one of the first off-canvas artists in Yunnan. You founded the Red Heart Commune in Dali, Yunnan Province, in 1994, and the Migratory Sky Art Space in Beijing in 2005. You have always been promoting interaction between Yunnan artists in the outside world, and have witnessed the beginnings and development of Yunnan artists born in the 70s. Please tell us a bit about what the situation was like when you founded the Red Heart Commune. Xue Tao: I first entered the studio to learn painting in 1989, in my first year of middle school, and I graduated high school and took the university entrance exams in 1994. Most of my classmates at the studio got married and had kids after graduation, and basically stopped doing art. It wasn’t like today, when you test into the art academy after a few months. Back then, it was normal to keep testing for four to five years. I felt that after working so hard to test into an art program, it would be a shame to give it up. I should persevere in doing what I liked. So I formed a commune together with Lan Qinglun, Duan Yusong and Shi Zhimin. We didn’t know about the 85 New Wave at the time, and had only seenScar Art in the magazines. We were all young artists in Dali, and we formed this group to help each other to continue with our passion. We had regular events such as exhibitions and exchanges, but we didn’t have a clear creative direction. In 1997 we started getting more members such as Su Yabi and Liu Kun. At the time, the only exhibitions in Kunming were for the Artists Association. We held our first exhibition in 1997. Our second exhibition, in 2000, was held at the Yunnan Art Academy Museum. Chen Changwei and a few others also joined. Later, we went on to hold an exhibition every two years, in a biennial format, which was influenced by the fad for biennial exhibitions at the time. Luo: You founded the Migratory Sky Art Space in 2005. Is it still there? Xue: Beginning in 2002, there were a lot more exhibitions in China, especially after the Loft was founded. In 2003, I did the Shadow New Media Exhibition with Xiang Weixing and a few others. You came to help for that one. Then, we held the Cry Sheep Exhibition at the Red Banana Gallery and Nordica. 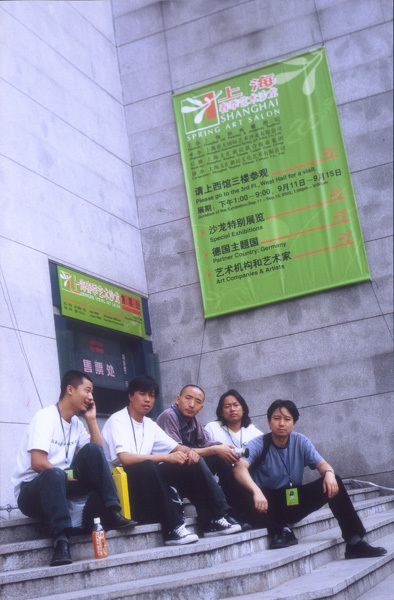 In 2003, we went to Shanghai for the Spring Art Salon, holding the Altitude Sickness Exhibition. Things were taking off in China, and everyone was actively taking part. That’s because after the 85 New Wave and “Post 89,” things had gone silent in the Chinese art scene. From the 90s to 2000, everything was quiet, and then suddenly a new energy burst forth in 2000. Chen Changwei, He Libin, He Jia and I stayed in Shanghai for a long time, interacting with artists from all over. Once our enthusiasm was let out, it couldn’t be pulled back in. Everyone had this impulse, this feeling that something big was about to happen in the Chinese art scene, though we didn’t know what it was. In 2004, He Jia and I went to Beijing, to the Binhe Neighborhood in Tongxian, which was one of the places artists had gathered after the Yuanmingyuan Artist Village was scattered. At the time, some of the Yuanmingyuan painters had been sent back to their hometowns, some of the ones with money had bought houses in Songzhuang, and others had moved into the Binhe Neighborhood. He Yunchang was there, as were most of the key members of the Kitsch Art scene. But I started wondering what I was doing there. If I wanted the settled neighborhood life, I was already doing fine in Kunming, with a salary and insurance. That’s not what I quit my job in Kunming for. Later, I went to Suojia Village and set up a space, one set up with money from Yunnan artists. It was called Migratory Sky. I wanted to make a platform for Yunnan in Beijing. Half a year after I set it up, they started demolishing Suojia Village. City officials said they were cleaning up the city’s image, knocking down buildings that weren’t up to code. Suojia Village fit the bill. I had just quit my job and borrowed money to set up this art space, and now, right at the beginning, I was facing a tragedy. When the demolition team came, everyone was asleep, and they made a big commotion as they came. We were surrounded by court officials, police and bulldozers. Luo: They didn’t notify you beforehand? Xue: There was a notice, telling us to knock down the buildings ourselves by a certain date. Of course, no one did, because we had just built them. Then, they suddenly showed up and demolished them. The first one they knocked down was Shang Yang’s studio. His wife fainted, and was taken away in an ambulance. He’s a very famous and respected artist in China. All kinds of people lived in that art zone, including Tan Ping, who was the Vice Dean of the Central Academy of Fine Arts. But it didn’t matter. The political atmosphere in Beijing was too thick. When we saw that they would even knock down Shang Yang’s place, we all knew the game was up. Migratory Sky split up after the demotion. Xue: No. We were lucky we weren’t fined. We had built it right across from the Village Council, on land rented from the village. The land used to be a graveyard, and they couldn’t do anything with it. It was just a bunch of weeds when we got there. The village was of course happy when we came to use it. We brought them income. Migratory Sky held two exhibitions, the first being an open studio exhibition, and the second being the Entertainment First Exhibition. There were about a hundred people at Suojia Village then, with artists from about a dozen countries. There were very few artist studios in the 798 Art Zone at the time, and people were even saying that 798 was slated for demolition. Luo: You recently wrote a preface for an exhibition on post-70s Yunnan artists, using the term “non-stream” to describe them. You wrote, “Non-stream is a state that is neither mainstream nor non-mainstream, a state outside of the streams. This is an outstanding feature of Yunnan artists.” Is this an awkward predicament, or is it about finding one’s own way? Xue: It’s a bit of both. It depends on what Yunnan artists want for themselves. If they hope to enter into the mainstream, then it’s an awkward predicament. If they don’t hope to enter into the mainstream, then it means they are finding their own path. But only the artist knows. Everyone else just sees them staying outside of the stream. Regional and cultural factors in Yunnan have kept many people outside of specific trends or streams. In Beijing, it is very clear. You are either mainstream or non-mainstream. If you want to fight the mainstream, you have to either step aside or form your own stream. Yunnan artists are none of the above. They don’t enter into the stream or resist it, and they don’t have any other stance either. Luo: Their goals are unclear. Xue: Right. They’re unclear. If they were clear, then in most cases, they would leave Kunming, at least for a while. That has been the case with the past few generations of influential artists since the 85 New Wave. Luo: You went to Beijing in 2004 to seek out better development, and watched as the Chinese art market exploded in 2006, and as it fell after the 2008 financial crisis. You have experienced Chinese art as it had no market, then had a flourishing market, and then bottomed out. As an artist, how do you understand the connection between artistic creation and the economic environment? Xue: This is a headache for me. Yunnan is too quiet. There are no surprises here. I went to Beijing to find surprises. Though there weren’t many galleries in Beijing at the time, I had a premonition that something was about to happen, so I quit my job and went. At the time, Chinese artists were all chasing after the “big face paintings,” painting in the style of Yue Minjun and Fang Lijun, with kitschy colors. It was the same with sculpture, with everyone working in fiberglass and automobile paint. Art made in this way saw certain market returns, and I was sometimes swept up in it too, but I pulled out. I was very conflicted. You need to have a market to survive, but the market is too tempting. In 2007, the artists were all crazy. Artists in Beijing from 2006 to 2008 were the luckiest artists in the world, because every year, there were two months of exhibition opening banquets every single day, which was heaven for artists who had been surviving on steamed buns up to that point. As long as you were an artist, you would get a lot of invitations. That is because the market was good, and the galleries were all looking for resources, so they were very nice to all the artists. It didn’t matter what kind of art you were making. As long as you were an artist, you were treated with a certain amount of respect. In those days, I basically slept till the afternoon, when I would head out for an exhibition banquet, with the galleries covering late night barbecue, karaoke, bars, the works. The artists had it great. In April and May, then again in September and October, there was food to be had every day of the week, and on weekends for the rest of the year. Sometimes I had no idea whose exhibition it was or who was footing the bill. Luo: Stuff like this can’t happen in Yunnan. Even though manna isn’t falling from the sky, the sky isn’t going to fall down and crush anyone either. The great ups and downs of the art market didn’t affect most artists here. Xue: These daily banquets wouldn’t happen anywhere else. There were a lot of foreign artists in Beijing at the time who were jealous of the Chinese artists, who by the age of 30 were renting studios by the acre rather than by the square meter. Their studios were big enough to park a small airplane. Think about it. In another nation’s capital, if an artist had a studio that was several hundred square meters, even a few acres, it would mean he was an important artist. In Beijing it was easy. It didn’t cost much at all. A lot of artists saw their entire destiny change in a single night in 2006 or 2007. When the financial crisis hit in 2008, everyone started shrinking their studios, and it all entered into a slump. Luo: Let’s talk about your artworks. You twist newspaper into ropes or compress it into shapes like blocks and balls. Some of your artworks are quite large. Do you make them yourself, or with assistants? Xue: I was making them on my own at first, but as the market got better, I started hiring assistants. There’s a couple that helps me a lot. The man is a renovation worker, and welds the frames for me. The woman is in charge of twisting the newspapers. Luo: Where do you get the newspapers? Xue: I get them from a newspaper distributor. They recycle the ones that don’t circulate, and I get my newspapers from them. Sometimes I get them from newsstands. Luo: Do you categorize them once you get them? Xue: I don’t. I just make selections. It has to be stiff copperplate paper. If it rips when you fold it, I can’t use it. It has to be thin copperplate or coated paper. It has to be easy to crumple, but it can’t tear too easily. Luo: Looking at your works over the past few years, the first thing one notices about your work is that it’s non-functional. Second, it doesn’t have a direct, easily-understood meaning. Third, your work is anti-formal. These traits are reminiscent of Arte Povera. Where do you get your inspiration? Xue: An Italian artist once showed me an artwork made from twisted-up newspapers. I thought it was mine, because I had made some with English newspapers, but it was actually the work of an Arte Povera artist in his fifties. When you twist a newspaper up into a rope, it all comes out in that shape. I think, however, that mine is a bit different. My art has gone through roughly three phases. At first, it was the basic feel for the material, and then I treated it as a modeling technique. In the third phase, I treat it as a language. The reason I use newspaper is that it’s cheap, easy to obtain and convenient. Luo: Your early works mainly imitated forms, such as the sun, flowers, pillars and the like. When we get to your rope works, we see that you have already cast off the modernist framework of form to pursue anti-form, alienation and individualized language. You emphasize a clear form, but do not consciously reveal your conceptual references. Xue: Right. By 2011, I had entered into a state I was rather satisfied with. Before, I was doing modern art or postmodern art, but now I have truly come to understand contemporary art. At first, you submit to modeling and material, and now modeling and material submit to you. In terms of technique, I also feel increasingly free. Luo: What is your view on the connection between your artworks and Arte Povera? Xue: My own creative trajectory has been akin to learning the breadth of art history, but when I really set out to create, I don’t think about any particular schools of art or art history. If you do think about such things, the creative process will not be a joyful one. If, after completing something, you discover that something similar already exists, I think that is normal. It demonstrates that between civilizations and art, there is more potential for human communication. As for the Arte Povera artists, I don’t concern myself much with what they are doing or thinking. I’ve been to Turin and Milan, where Arte Povera began, and I have seen their works, only to discover that we are not quite the same. Luo: In the narrow sense, Arte Povera is postmodern Italian art from the mid-1960s to the late 1970s. It was an art movement that arose in response to the drastic social changes and political schisms taking place in Italy at the time. Arte Povera artists presented found objects in dramatic ways to criticize consumerism, seek new ways of intervening in the world, and challenge the traditional order and aesthetics. This movement had a profound impact on contemporary art concepts and methods around the world. Let’s return to the previous question. Do you think that Yunnan possesses certain resources or value that it can provide to contemporary artists in today’s globalized context? Xue: To ask whether or not Yunnan artists can provide more meaningful references is like asking what Chinese artists can provide for the world. I would be hard pressed, using my own abilities, to answer this question, because I think it is unclear whether or not Yunnan can provide contemporary art with a new model, new methods, new concepts or a new condition. This must be answered by history and time. As an individual, I am infinitesimal. I cannot transcend time and space to see the results. Luo: How do you maintain a flow between your increasingly rich international experience and your inherent Dali experience? For instance, how do you bring your experience of globalization to Dali, and how do you bring your local experience into the contemporary context? Xue: This is an important question, one many artists must ponder. I think that contemporary art is an extremely open language mode, one which gives artists great freedom. Just to have this language, however, is not the end. What matters is what you say with it. In global contemporary art, I have learned this language mode and method of interaction, allowing me to interact with people from different countries and different language backgrounds. As a Yunnanese born in Dali, or as an Easterner, my interest and understanding of handcrafting and Zen Buddhism is infused into my art. Some people may use contemporary art to express sociological or scientific matters, but I think that my own expression is more religious. Luo: This calls to mind Mono-ha, because Mono-ha also used everyday objects, while they drew spiritual resources from Zen and Shinto to explore the relationships between something and nothingness, between man and thing, thing and space, man and space, referencing materiality. Arte Povera was more directed towards social criticism. Xue: My art is none of the above. It may appear similar, but when placed together, they are quite different. Neither Mono-ha nor Arte Povera are as produced as my art. The difference is in this production aspect. The production aspect of Mono-ha is concealed, secondary, with the emphasis placed on materiality itself. My artworks highlight the production process. Luo: You make the energy of vast amounts of highly repetitive labor come to rest on ordinary materials. Xue: Right. I am most satisfied and interested in the production process. What people see is not an object, but a production process. There is a massive amount of manual labor within. As I understand Buddhism, Mono-ha and Arte Povera, Mono-ha is about “emptiness” while Arte Povera is about “substance,” while Buddhism is neither emptiness nor substance. What is expressed in the end is the “non-duality of emptiness and substance.” I see Mono-ha as a philosophized understanding of religion. Its understanding of Zen and the Dao is philosophical. Buddhism is neither philosophy nor wisdom. Zen is different. In India, Zen is called “dhyana.” Zen cannot be explained. If it can be explained, then it is something different. It is just like all of these ropes I have made. I can’t explain clearly what they are, but in the end, I am satisfied. It feels right. 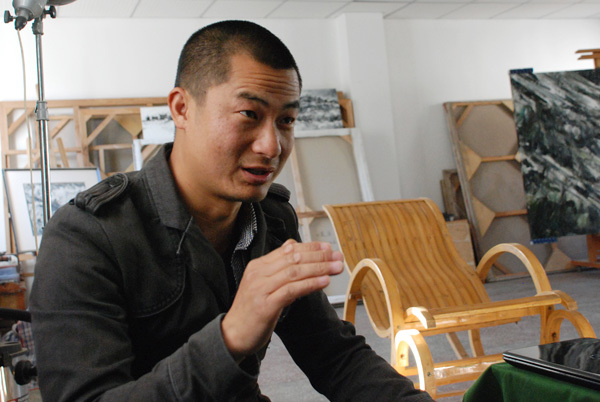 He Libin: In recent years, the Chinese contemporary art market has been aggressively encroaching on young Yunnan artists. The situation is not as good as it was in 2000, much less the 1980s. Xue: When the Red Heart Commune first began, a lot of the artists were making installation art. At the time, Shi Zhimin used glass, X-ray plates and acrylic to make his graduate thesis work. He was placed under investigation, and in the end barely got his degree. hen Changwei and Duan Yisong all worked in installation art. In those days, a lot of people were making experimental artworks. For instance Ning Zhi, who was from the same graduating class as us in 1998, was also making installation art. The young people were basically all working in off-canvas art and conceptual photography, but later on, they all basically stopped. Luo: After the market picked up, most people shifted to canvas painting. The last time a lot of Yunnan artists were making experimental art together was with Jianghu in 2005 and 2006. He: When the market began to dominate art in 2006, artists came to see their positions and goals more clearly. Of course, the end of Jianghu in 2006 had nothing to do with the market. Luo: As post-70s artists, do you think there are any clear shared characteristics among post-70s Yunnan artists? Xue: A lot of the post-70s artists are multi-talented. For instance, Wu Yiqiang, Shi Jing, He Jia and Zhang Tian all work in painting, performance art and installations. He: If we’re looking at it based on time, I think that the post-70s generation is in a rather anxious mental state, and this finds expression in their artworks. Post-80s artists find ways to dispel this sense of anxiety. Older artists have a clearer connection to the ideology of the state. They are imprinted by the state. Luo: I feel that Xue Tao’s creative experience is quite representative of the post-70s artists. This generation got started in the traditional art academies, learning colors and modelling. They then went through the modernist enlightenment, self-awakening and the artist group movement. Then they entered into contemporary art within the patterns of globalization, using individualized language and spirit to express artistic concern within the context of globalization. Among earlier Yunnan artists, very few truly entered into contemporary artistic language, with most artists born in the 50s and 60s absorbing modernism or pacing about between modern and postmodern in a quest for Chinese schemas and the expression of the Chinese experience. Their contributions are mainly connected to the post-Cold War unification of the international economy, the collectivist narrative of modern Chinese society and resistance to the same. Their advancement of contemporary artistic concepts was highly limited, and that is why, after they were successful, the only thing they brought, aside from insight into success, was modernist sentiments left over from the 85 New Wave. They didn’t engage in much exploration of artistic concepts. Some artists are creating contemporary art at the same time they are painting Impressionist or Romanticist landscapes. I can understand that as they satisfy increasing domestic demand, they don’t have to focus so much on export as with contemporary art, but this phenomenon shows that they are lost and conflicted about their individual artistic mission. That is not to say, of course, that one cannot create artworks for the masses; that is another issue altogether. Xue: The “85” artists basically work within a modernist context. Some artists of the post-60s generation entered into the contemporary, such as He Yunchang. As for the post-80s generation, the question is whether or not they’re interested in art in the first place. Luo: A lot of post-80s artists have been influenced by the individual icon methodology and success schemes. Artistic concepts have been flattened and fragmented, many of them secondhand in the first place. They need to raise their individual character. He: You raised the question of whether or not Yunnan could provide contemporary art with new possibilities. At this point, I’m not optimistic. Yunnan has its own culture that is markedly different from that of the Central Plain. In fact, southwestern Chinese art as a whole is different from that of other regions. For instance, it places more emphasis on expressiveness, temporality and spiritual experience. The artworks are more closely connected to nature. Setting out from a regional perspective, it is possible that Yunnan can produce something of value, but the future isn’t so clear. Xue: Among the art spaces in Yunnan that do true contemporary art, TCG Nordica is one, then there’s Liu Lifen’s Contemporary Yunnan, as well as the Lijiang Studio. These three art spaces all have strong international backgrounds. There are also a few individuals who engage in contemporary art creation and curation, but that’s it. Statistically speaking, it is very small, and the role such small numbers can play is very limited. If we took those away, Yunnan would basically be a desert, with nothing but the modernist influence left behind from the 85 period. Kunming still ranks up there with some of the big contemporary art cities such as Beijing, Shanghai, Guangzhou, Chengdu and Chongqing, mainly because most cities lack contemporary art spaces that are truly rooted in their localities. Why are there so few? It is because there is no demand. If there was more demand, then there would be more. This shows that China is not prepared to enter into the contemporary art context. It hasn’t prepared at all; it is simply making the preliminary preparations. Luo: The Chinese language academic scene has dubbed the last century of change as the modern transition, the transformation from a traditional society to a modern civilizational order supported by core modern values (freedom, reason and individual rights) and run according to market economics, democratic government and the ethnic nation-state. Critic Zha Changping describes contemporary China as a mixed modern society, where the premodern, modern, postmodern and alternative modern are mixed together, often interlocking and overlapping. This shows that China is not prepared to enter into the globalized world. It tends to view the world with a nationalist, clan-based worldview rather than universal values. One of the missions of Chinese contemporary art is to take part in promoting China’s modern transition. Everyone knows that Yunnan is richly endowed geographically, ecologically and culturally. The key is for artists to change their vision and language. Today’s scene has developed into an ecosystem comprised of nature, society and culture, and when we look at this scene, we must keep in mind the pressing rural issues of land and left-behind children, the disparity of wealth and environmental issues. Beyond direct concern for social justice, even in artistic form, we must engage in a transformation of traditional aesthetic taste, of observational methods and concepts. Otherwise, we will always be in a state of cultural dislocation and chaos.